Latino students were described as “mediocre” and “pretty bad” in an email that was accidentally sent by a professor to students registering for a mock trial class at the University of Maryland. In the email to students, Abigail Graber wrote that she had a question about diversity. While lamenting that they had “almost no Latino students on team,” she proceeded to say that the Latino students were not very qualified for the class. Are latino students, by and large, “mediocre” and “pretty bad”? The Washington Post does not investigate this but the facts are easy to come by. Please, please, please stop confusing valid, contextual assessments for bias or racism. It undermines real issues of inequality and bias and adds support to those who criticize valuable programs such as affirmative action. I am a woman and minority who has understands these challenges but this is not the case. This is a private conversation that was actually trying to provide greater consideration for diversity despite, what seems to be, an honest assessment that for convenience sake, was categorized. Like saying those “short kids aren’t really good at basketball but they play hard and should we consider other things as part of eligibility of the fitness program.” It is unfortunate that these two were fired instead of the school using this issue as an opportunity for dialogue since this is a real life example of how so much of how we are understood is based on the good intentions we project on the speaker. Another point from my new FAQ on the Richwine whoop-tee-doo in Taki’s Magazine. Only 36 percent of young Hispanic high school graduates would score in AFQT Category IIIB [31st percentile] or above, compared with 68 percent of white high school graduates. A key implication of this result is that increasing the high school graduation rate among Hispanic youth may not lead to comparable increases in enlistment eligibility. Note that this comparison excludes the large percentage of young Hispanic high school dropouts. So, 64% of Hispanic high school graduates (in the major 1997 National Longitudinal Study of Youth study funded by the federal government) score in the bottom 30% of the AFQT, versus 32% of white high school graduates. Now, problems with the English language are an issue that sap Hispanic performance on the AFQT to some extent, but we’re still talking about Hispanic high school graduates here, not dropouts. Also, the NLSY97′s sample consisted of 9,000 kids from 12 to 16 on 12/31/96. So, it doesn’t include immigrants who arrived after that age, and, I suspect, it would be light on illegal immigrants and even children of illegal immigrants, whose parents probably wouldn’t be as quick to volunteer them for a study where the federal government tracks how they are doing each years for the rest of their lives. That’s not horrible, but getting slightly less education than African-Americans isn’t good, either. As I point out in my FAQ in Taki’s, because Hispanics average higher overall on IQ tests than blacks, they ought to be getting more years of education than blacks get. Thus, IQ testing implies that Hispanic educational achievement is being depressed by the Hispanic culture of apathy toward education, which is something that could be fixed in the very long run — an insight for which everybody ought to thank the IQ testing experts, not sneer at them. There’s no mention of IQ in this New York Times article. When you account for IQ, there’s no significant under-representation for blacks and latinos in America’s top universities and in high IQ occupations. The average African-American IQ in America is 85, the average latino IQ is 90, the average white IQ is 100, the average East Asian IQ is about 105 and the average Ashkenazi IQ is between 105-115. Does affirmative action make people more or less likely to hire a black professional? Not much is happening other than Asians are scoring higher. – And it’s almost as if the massive increase in Asian-American and foreign Asian enrollment in colleges had to hurt other groups’ numbers due to simple arithmetic. 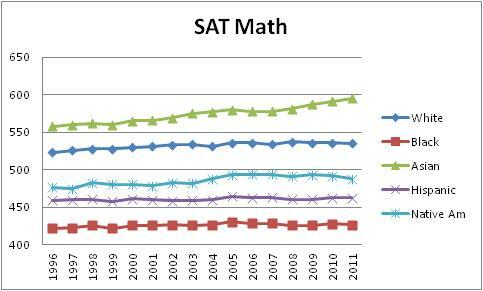 Blacks make up only 2% of those scoring on the math SAT 650 to 700, 2% of 700 to 750, and 2% of 750 to 800. In contrast Asians make up 27% of 650 to 700, 39% of 700 to 750, and 60% of 750 to 800. A 650 on math is a good score, but not amazing: it’s at the 86th percentile of those who take the SAT and the 90th percentile of a nationally representative sample (including those who missed out on taking the SAT because they were in Juvy Hall). So blacks make up 6% of elite college freshmen but only 2% among those scoring at the 86th percentile or higher on the Math SAT. Of course, blacks don’t benefit from White Privilege. 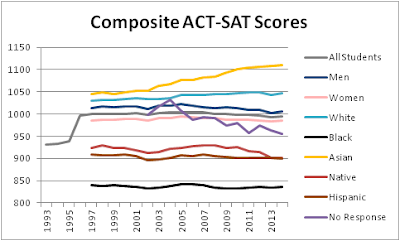 Here’s the Brookings article on how test score gaps aren’t closing much. 1. IQ (as long as it's a good measure of g) predicts a broad range of life outcomes better than does SES [socio-economic status], from GPA to longevity. Corollary: You can wash out IQ's apparent predictive superiority only if you load your SES battery with additional surrogates for parents' or own g.
2. The phenotypic correlations between IQ and measures of social class (education, occupational prestige, income) are from a half to two-thirds genetic in origin. 3. SES cannot explain the big IQ differences among siblings growing up in the same household: They differ two-thirds as much in IQ, on the average (11-12 points), as do any two random strangers (~17 points). This is a glaring fact that SES enthusiasts have studiously ignored. 4. Adult functional literacy (e.g., see the fed's NALS survey) predicts life outcomes in exactly the same pattern as does IQ, though they won't tell you that. Functional literacy is measured by having subjects carry out everyday life tasks, such as using a menu to figure out the price for something. Persons scoring at levels 1-2 (out of 5) have been described as not having the ability to use their rights or meet their responsibilities in the modern world (40% of whites, 80% of blacks). Pick out a few NALS tasks at various levels and ask your critic what % of adults s/he thinks can perform them. They will be shocked and so will you when you see the data–go to my 1997 "Why g matters" article for NALS, or my 2002 "highly general and highly practical" chapter for health literacy items–e.g., on diabetes. 6. A large followup of Australian veterans found that IQ was the best predictor of death by age 40 (had 50+ predictors). Vehicle fatalities were the biggest cause (as is typical), and, compared to men with IQs of 100+, men of IQ85-100 had twice the rate and men IQ 80-85 had three times the rate. (Remember, SES could not explain this.) The US (and apparently Australia) forbid induction of persons below IQ 80 because they are not sufficiently trainable–found out the hard way. 7. Finally, if you succeed in describing g as a general learning and reasoning ability (one that gives high g people an increasing edge when tasks are more complex), then it is easy to show g's life and death relevance when you describe how health self-care and accident prevention are highly dependent on learning and reasoning. Consider what it takes to be an effective diabetic–lots and lots of judgment on a daily basis, or you're likely to lose your sight, your limbs, etc. Gottfredson said: "Keep in mind that false belief in infinite human malleability led to some of the worst horrors of the 20th century. I also think it is patronizing and usually self-serving when elites contend that the American public cannot be trusted with certain facts." If all 13‐year‐olds took the same 15‐minute test (WASI), I could give you each child’s odds for all these adult outcomes without knowing anything else about them. The first step in assessing the real-life importance of g/IQ is to determine whether scores on highly g-loaded tests (tests that measure g well) predict differences in valued life outcomes. Correlations do not prove causation, but they are a first step in doing so. The most studied outcomes are performance in school (such as school marks and achievement test scores), performance on the job (mostly supervisor ratings), socioeconomic advancement (level of education, occupation, and income), and social pathology (adult criminality, poverty, unemployment, dependence on welfare, children outside of marriage). The relations of intelligence to health, health behavior, resilience in the face of extreme adversity, longevity (length of life), and functional literacy (the ability to do routine reading, writing, and arithmetic tasks in modern societies) have also begun to draw much attention. Thousands of studies have looked at the impact of mental abilities on school and job performance, and large national longitudinal studies in both Europe and the United States have shown that IQ is related to various forms of socioeconomic success and failure. Here are their most general findings about g’s association with life outcomes. Correlations with IQ are pervasive. IQ predicts all the foregoing outcomes to some degree. Subjective well-being (happiness) is the rare exception: it is regularly found not to correlate meaningfully with IQ level. In general, g relates more to instrumental behavior than emotional reactions. Correlations with IQ vary systematically by type of outcome. IQ’s predictive value ranges widely, depending on the outcome in question. For example, when averaged over several years, performance on standardized tests of academic achievement correlates about as highly with IQ as two IQ tests do with each other (over .8 on a scale of -1.0 to 1.0). In contrast, correlations with IQ are closer to .6-.7 for school marks, years of education completed, and longevity. They are about .5 with prestige level of occupation, .3 to .4 with income (the correlations rising with age), and .2 with law-abidingness. Correlations with IQ are higher when tasks are more complex. To illustrate, when jobs are ranked in overall complexity of work, the correlations between IQ and job performance rise from .2 for simple, unskilled jobs, to .5 in middle-level jobs (skilled trades, most clerical work), to .8 in the most complex (doctors, engineers, top executives). Stated another way, it matters little how intelligent workers are in low-level jobs, but it matters a great deal in high-level jobs, regardless of whether the job seems academic or not. IQ 75 signals the ability level below which individuals are not likely to master the elementary school curriculum or function independently in adulthood in modern societies. They are likely to be eligible for special educational services in school and for Supplemental Security Income (SSI) from the U.S. government, which is financial support provided to mentally and physically disabled adults. Of course, many do marry, hold a job, raise children, and otherwise function adequately as adults. However, their independence is precarious because they have difficulty getting and keeping jobs that pay a living wage. They are difficult to train except for the simplest tasks, so they are fortunate in industrialized nations to get any paying job at all. While only 1 out of 50 Asian-Americans faces such risk, Figure 3 shows that 1 out of 6 black- Americans does. IQ 85 is a second important minimum threshold because the U.S. military sets its minimum enlistment standards at about this level. Although the military is often viewed as the employer of last resort, this minimum standard rules out almost half of blacks (44%) and a third of Hispanics (34%), but far fewer whites (13%) and Asians (8%). The U.S. military has twice experimented with recruiting men of IQ 80-85 (the first time on purpose and the second time by accident), but both times it found that such men could not master soldiering well enough to justify their costs. Individuals in this IQ range are not considered mentally retarded and they therefore receive no special educational or social services, but their poor learning and reasoning abilities mean that they are not competitive for many jobs, if any, in the civilian economy. They live at the edge of unemployability in modern nations, and the jobs they do get are typically the least prestigious and lowest paying: for example, janitor, food service worker, hospital orderly, or parts assembler in a factory. IQ 105 can be viewed as the minimum threshold for achieving moderately high levels of success. It has been estimated to be the point at which individuals have a 50-50 chance of doing well enough in secondary school to be admitted to a four-year university in the United States. People above this level are highly competitive for middle-level jobs (clerical, crafts and repair, sales, police and firefighting), and they are good contenders for the lower tiers of managerial and professional work (supervisory, technical, accounting, nursing, teaching). Figure 3 shows that Asian-Americans are 6-7 times more likely than blacks to exceed the IQ 105 threshold. The percentages are 53%, 40%, 27%, and 8%, respectively, for Asians, whites, Hispanics, and blacks. IQ 115 marks the ability threshold for being competitive as a candidate for graduate or professional school in the U.S. and thus for high levels of socioeconomic success. Partly because of their higher educational promise, individuals above this IQ level have the best prospects for gaining the most coveted occupational positions in a society. This is the IQ range in which individuals can be self-instructing and are, in fact, expected to instruct, advise, and supervise others in their community and work environments. This is therefore the IQ range from which cultural leaders tend to emerge and be recruited. The percentages exceeding this threshold are, respectively, 40% (Asians), 28% (whites), 10% (Hispanics), and 4% (blacks). This entry was posted in Latino. Bookmark the permalink.